When it comes to hair, I think genes play a big role. There is absolutely no way to control how your hair grows naturally, but there are plenty of ways to modify your hair to make it closer to what you want. My hair is thick all together, but each individual strand is fine, so it is prone to breakage. A month or two ago I was noticing that I was experiencing a huge fly-away problem. It looked like I had been electrocuted! This is obviously something every girl tries to avoid, because flyways make even the most sleek hairstyle appear unkempt. I decided to try some different things to reduce those annoying little short strands. The first thing I did was buy a wide toothed comb from the drug store. I had heard time and time again that you should always brush your hair with a wide toothed comb after a shower to reduce breakage, but regardless I was still using my large paddle brush. Next I conveniently re-discovered a Bumble and Bumble de-tangling spray I had bought years ago. 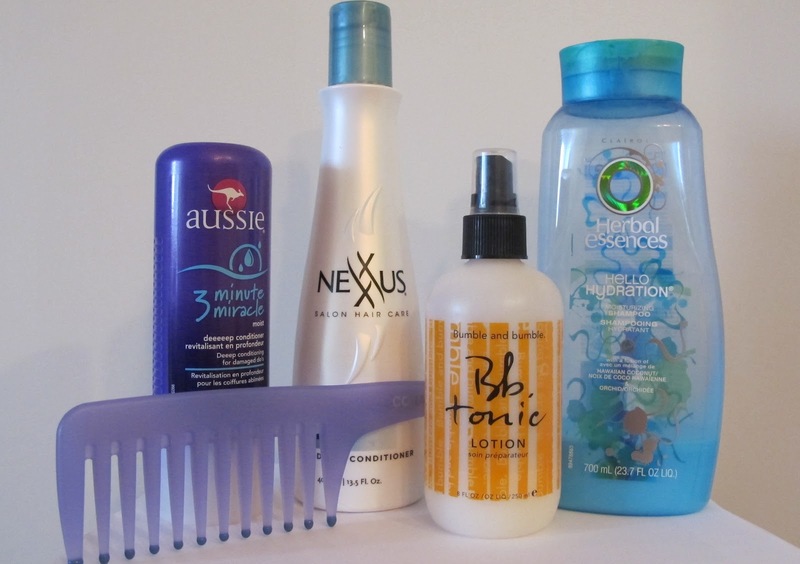 A detangler eases post-shower combing even more and puts less stress on the hair. So I began spraying my hair with detangler and combing it with a wide toothed comb. I have definitely seen an improvement even from these simple steps. The flyaways never disappear, but the breakage was noticeably reduced. Of course, I was not satisfied with this one simple change and I had to find out what else I could do. I had heard a lot about the Aussie 3 Minute Miracle hair conditioner and decided to give it a go. It is incredibly inexpensive at just $3.99 and can be bought at any place that sells Aussie. I absolutely LOVE this product. Not only does it smell amazing, but it makes your hair feel like silk! You simply apply it after you shampoo your hair, leave it for 3 or more minutes (this is easily done...just shave-wash your face-wash your body, whatever else you need to do!) and then rinse it out. An important step to getting the most out of this product is making sure you rinse your hair with cool to cold water before you get out of the shower. I think that the shot of cold water helps seal the hair cuticle-reducing breakage and increasing shine. I use the 3 Minute Miracle almost every time I shower unless I'm in a big rush. I'm not entirely sure if you're supposed to use it every time, but it makes my hair feel SO much better than my other conditioner. So that step has also really, really helped the condition of my hair. For shampoo, I haven't found a Holy Grail product yet. I try new shampoos all the time. Currently I am finishing up my Herbal Essences moisturizing shampoo for dry hair. It has done a decent job, but I will probably try something different when it runs out because it didn't blow me away. When I'm not using my Aussie conditioner, I have been using this Nexxus conditioner that is supposed to seal up split ends. I randomly got this conditioner as a sample and I loved the smell so much I bought it! Plus it came with a $3 off coupon so that helped push me to buy it...because for a drug store brand its quite pricey! This conditioner is nice, it does make your hair feel pretty silky when you are rinsing it out, but I won't be buying it again- I will probably try something new and hopefully even better! I think another thing that helps the condition of my hair tremendously is very minimal heat use. Mostly due to laziness I only usually blow-dry my hair once a week-ESPECIALLY in the summer. In the winter that number increases to probably 3 or 4 times/week because it's so cold you can't leave the house with wet hair! But the lack of heat use in the summer most definitely benefits my hair. So that is pretty much it for my current hair story. ~I have a neat little trick for reducing flyaways that I am going to show in another post coming soon!~ Do you guys have hair products you can't live without, please do share! !